Description: The GP15-1 perfectly obscures the view of F40 9999. Description: A mountain railroad in south Georgia? CSX train Q255 negotiates the undulating profile of the Fitzgerald sub at the north end of Rebecca. Description: Ex-Reading station, 1255 hours. Description: CSX Q117-20 brings up the Monday Power Shuffle with eight units today. Description: Pair of ES44DC's pull stack train Q190 eastbound along the high line. Description: Holding at CP-Belt for a 66Q, this train is detouring the Penn route due to a derailment just outside of Richmond, VA. Description: Q173 detoured today via NS due to a derailment in the Richmond, VA area on CSX, holding at CP-53 for some EB traffic. Description: Q348-13 craws past CP-229 on track 1 running on the CSX Indianapolis Line. 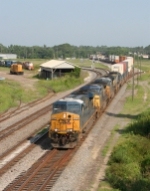 Description: CSX train Q740, northbound Tropicana juice loads, moving from a former ACL to a former SAL alignment at the former junction location of Owensboro, just south of Lacoochee, FL. Description: L438 at East Jct.